When Source Music Entertainment debuted G-Friend in 2015, the company couldn’t have possibly realized they were debuting a rookie group that would be this successful in such little time. After all, popularity in K-pop is theorized to be correlated to the company’s size, since that’s indicative of its financial resources and experience. Flash forward a year and G-Friend has surprisingly made a place for themselves in K-pop. At first, their viral video of “Me Gustas Tu” brought more attention to them, but now all eyes are watching G-Friend with this promotional cycle’s “Rough”. So far, it has garnered them their first win, along with four successive others, achieving an all-kill on the week’s music shows. However, it’s not just the strength of the title track that has led to their success. Snowflake is the supposed last part in their trilogy of high school concepts, and has high thematic cohesiveness and a sense of maturity that speaks for the potential to this group. With “Snowflake”, there is an instant sense of drama in the soundtrack-esque introduction. The clock ticking slowly builds intensity with the addition of string instruments and the moody chords of the keyboard. Then the trademark G-Friend sound enters with all its brightness and positivity, and the dramatic keyboard switches to the lighter sounds of the xylophone. The guitar backing provides a solid background so that G-Friend’s echoey repeated lines feel dynamic. And, as with all good introductions, it fades and builds anticipation for the coming tracks. The first ten seconds of “Rough” sound like the start of a stereotypical bubbly song about love until a lovely minor melody emerges from the background, which is right where the song picks up the tempo. Compared to their previous releases of “Glass Bead” and “Me Gustas Tu”, G-Friend doesn’t sound cutesy at all. They sound determined and confident in what they’re singing, which is emphasized by the punctuated melodic background. Of course, the sound of this song doesn’t stray from the easily accessible sound of G-Friend’s songs, which tend to sound like an opening drama OST. However, to update “Rough”, the song utilizes water drops and clock ticking, which work with the album’s meaning. The song speaks to a love that is present, but unable to fulfilled due to the two being in different places in their lives. Snowflake is the title of their album because it is a symbol of a unique love that seems impermanent. The water drop is the melting of the snowflake, and the clock ticking represents the short lifespan of their love. The synth in “Say My Name” creates a very retro sounding track, which is further made exciting by its use of a melody that explores the lower range of G-Friend. K-pop songs tend to over-emphasize high notes due to the belief is that is a testament of a singer’s prowess. However, lower melodies of “Say My Name” allows greater change in feeling when those higher notes come in along with more space in the piece for harmonies. The use of arpeggios hidden in the background modernize the song while keeping it in theme with the loveliness of a schoolgirl concept. As for the song’s lyrics, at this stage in the album’s progression, G-Friend is struggling to give up this love because they are trying to be realistic. “Say my Name” ended with just words and no melody, which draws attention to the spoken introductory section of “Luv Star”. The lower range is explored in this song as well, but “Luv Star” is much more overtly cute. “Luv Star”‘s uplifting feeling makes this song almost akin to a Disney song. Lyrically this song conveys the same type of story as “Rough” but now G-Friend has decided to maintain their love despite the circumstances. The star is a reminder of the brightness of their love, and its persistence to shine in the dark sky, which is why G-Friend has mustered the courage to be resilient about their love. Immediately, “Someday” feels like the image song of a protagonist of a Korean drama as he or she is strolling along, skipping happily. Here the lyrics speak towards trying to share the happiness G-Friends finds in love with their partner. With such a romantic sentiment the song reflects that idea with catchy repeated phrases and happy chants. But the true strength in this song lies in the buildup and the actual climax of the song. At first the song sounds like it will go with the cliche long drawn out high note, but it quickly subverts the obvious and slows down. The actual high point of the song is punctuated with very rhythmical instrumentals. In doing so, the music reflects the roller coaster effect of love from the happiness, to doubt, to – in this case – the strong resolution to pull through any difficulties. This is the definitive moment in the album where, lyrically, G-Friend figuratively embrace their love. Instead of feeling shy or feeling sad, they face their feelings head on. Every album needs a slow song, but “Trust” is definitely not a throwaway song. The singing execution of their lines at the start is slow and separated, but not punctuated. This allows them to express the shyness of their feelings in the past, as they recount the beginning of their love. However, from the moment the chorus enters, the smoothly sung melodic lines convey their confidence in their resolutions. G-Friend maturely acknowledge their fear of the future, but stay the course with their belief in the potential of this love. Snowflake was a surprise in that the songs flowed lyrically and never felt jarring as the tracks proceeded. The use of a snowflake as a symbol of unique love that seems impermanent was definitely interesting. This is because while the snowflake never maintains its original shape, it just changes to water. 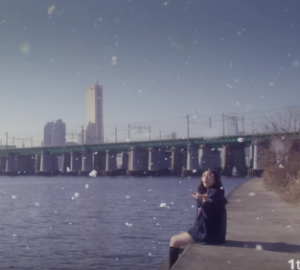 Like the snowflake, G-Friend changed from girl to woman as they embrace their feelings and become proactive to deal with any challenges, both internally and externally. While G-Friend is still a rookie, this mini album solidified their foundation of nostalgic catchy music but brought in potentialities that might speak towards their future sound. Did you enjoy the album? What was your favorite track?